There is Such a Thing as a Free Lunch for Simi Kids! Having our kids eat healthy this summer just got easier with the Summer Food Rocks! Food, Fun & Sun! program. In partnership with the Rancho Simi Parks & Recreation District, the Simi Valley Unified School District will offer free lunch to children 18 and younger at Rancho Simi Community Park, 1765 Royal Ave (near Erringer Road). Beginning June 9 and running through Aug. 1, lunch will be served at 11:45 a.m. Monday through Friday. 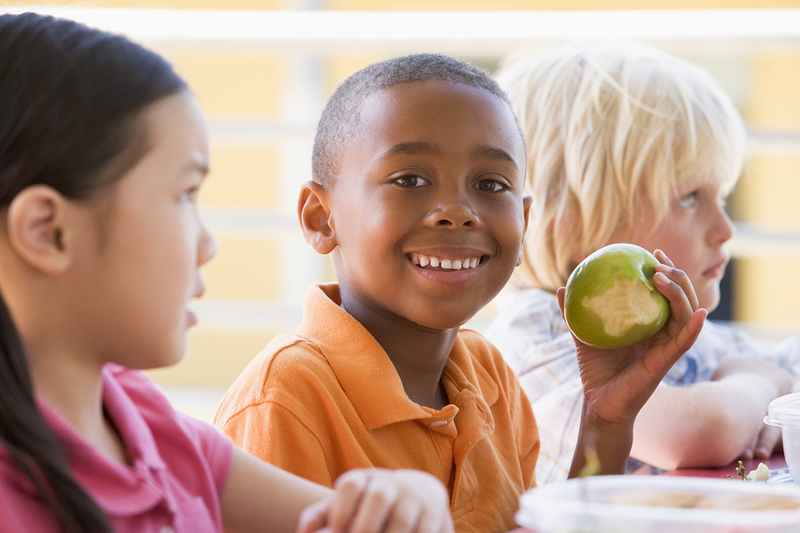 Each nutritious lunch will include a fruit and vegetable, choice of milk, chocolate milk or water, and a rotating choice of sandwiches, pizza, corn dogs and burgers. Lunch will not be available on July 4 due to the Independence Day holiday. For more information, call 8805-306-4500, ext. 4702 or email montserrat.padilla@simivalleyusd.org. Posted on May 9, 2014 Categories Free Programs, Nutrition, Rancho Simi Parks & Recreation District, Summer, UncategorizedTags Free Lunch, Summer, SVUSD8 Comments on There is Such a Thing as a Free Lunch for Simi Kids! Our Kids do Amazing Things! 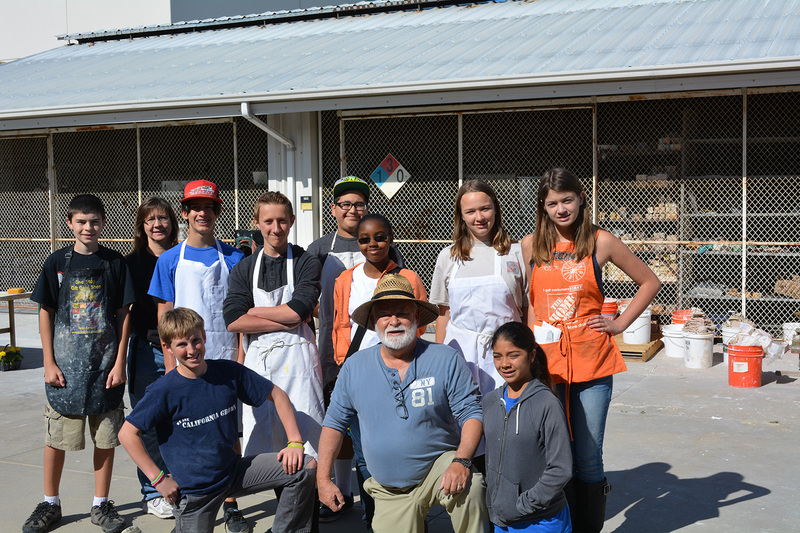 On April 26, a team of 10 students from Hillside Middle School battled high schoolers at the annual Clay Day competition at California State University-Northridge and emerged victorious! With two first-place finishes, two second place and three third-place finishes, Hillside’s pottery team stood proud in the face of many area high schoolers. Josh Franco and Jerry Butler team up for the Twin Throw. 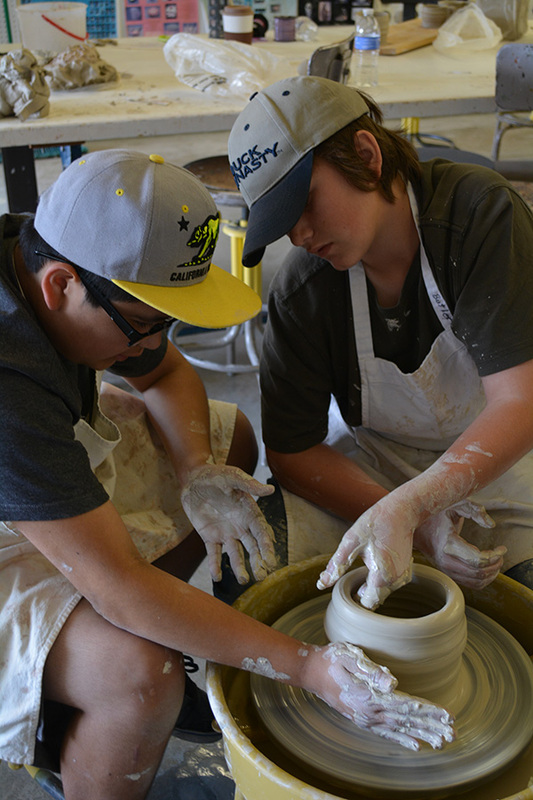 Clay Day is a pottery competition that challenges students in teams and individually to throw the tallest, or widest pots. Other contests include smallest wheel thrown pot, a pot thrown by a blindfolded potter and the potter who throws eight pots fastest. Still other young potters face off to build the tallest hand-built structure, create a fantastic sculpture, fabricate the most imaginative vehicle and in the final task, pull the longest handle. From left to right: Front row: Justin Hibbit, Coach Galvin, Zalma Quezada. Back row: William Malone, Mrs. Judi Malone, Scott Dodge, Josh Franco, Hayley Williams, Taylor Blomquist and Amanda Adams. The students included eighth graders Amanda Adams, Jerry Butler, Scott Dodge, Josh Franco, Justin Hibbits, Joey Kraige, Wiliam Malone and Zalma Quezada. Seventh grader Haley Williams and sixth grader Taylor Bloomquist finished off the team. 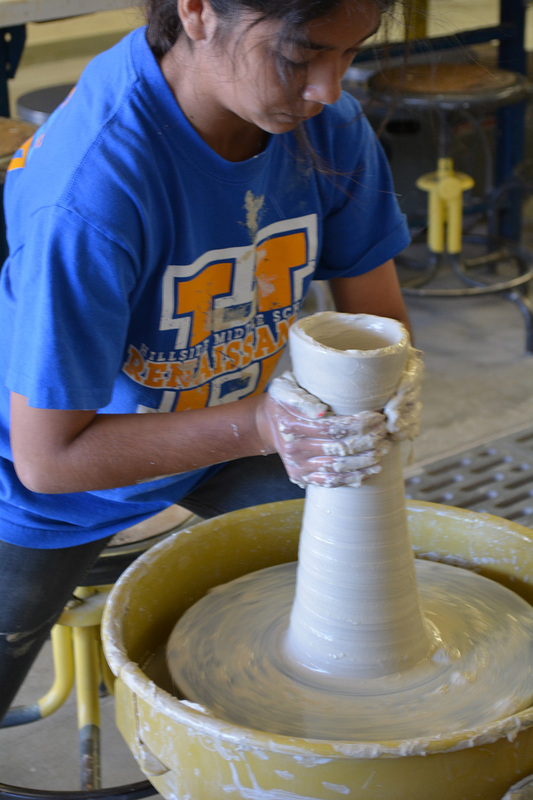 Zalma Quezada throws her entry for the Tallest Wheel Thrown Pot contest. Teams from Hillside have competed in the past, and surprisingly come away with some first place awards. “The younger potters do not know that there are some things too difficult to do. They fearlessly plunge ahead and achieve great things, not knowing they have done the impossible,” said Coach Stephen Galvin, Hillside’s art teacher. We are proud of ALL of our Clay Day competitors! Throw on, guys. Posted on May 6, 2014 May 6, 2014 Categories Art, Competition, Hillside Middle School, Our Kids Do Amazing Things!, UncategorizedTags Art, Clay Day, competitions, CSUN, Hillside Middle School, Simi Valley, Simi Valley Unified School District, SVUSD2 Comments on Our Kids do Amazing Things! On April 29, 2014, the SVUSD Board of Trustees met for a Special Board Meeting-New Technology Bond Workshop. The purpose of this workshop was to update the Board on what the process would be for placing a voter-approved bond on the 2014 election. There were also two action items that the Board members decided upon. Three Board members were present for the meeting: Arleigh Kidd, Dan White and Rob Collins. Trustee Debbie Sandland called into the meeting from out of town. Trustee Jeanne Davis was absent. A full transcript of the meeting agenda and back up materials is available HERE. By a 4-0 vote (Davis absent), the Board agreed to rescind three certificated staff development furlough days from the six originally scheduled for the 2014-15 school year. 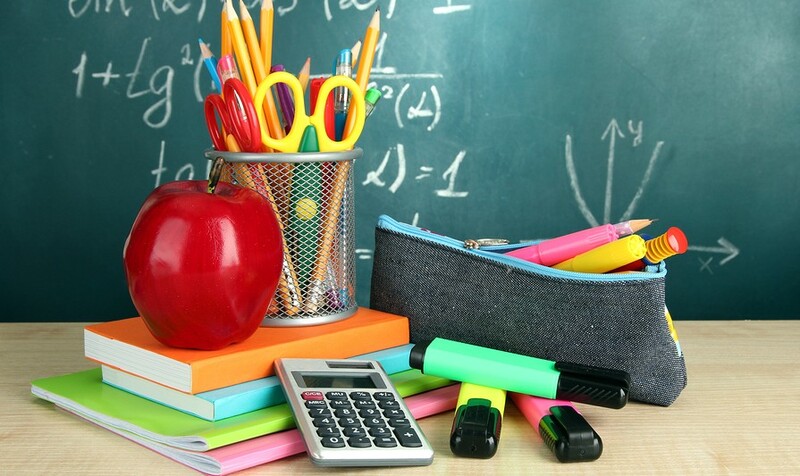 Money expected from the State of California to help fund the implementation of the Common Core State Standards will be used to for these staff development days for a cost of $981,912.09, as is allowed under the State’s guidelines. By a 4-0 vote (Davis absent), the board approved the agreement with Public Agency Retirement Services (PARS) to manage a supplementary retirement plan (SRP) for eligible employees. (More commonly referred to as the district’s early retirement plan.) The board also agreed to extend the deadline for SRP applications to May 9 to allow for additional applicants. This will not affect the standing applications. The District reported that a total of 94 eligible employees applied for the SRP, including nine from certificated management, 40 from certificated, 6 from classified management and 39 from classified. Early numbers estimate that the District will save $1.2 million over the next five years. Superintendent Dr. Kathryn Scroggins said Wednesday that there was more than enough participation in the SRP to rescind almost all of the Reduction in Force (RIF) notices sent out in March. In other words, almost no RIF layoffs are expected as there was enough participation to offset the cost savings sought from the RIF. “Most of the people who have received RIF notices are being contacted that the PARS has been approved by the board, and based on that action, their RIFs will be rescinded on May 13,” she said. In 2004, voters approved the $145 million Measure C4 bond by 62 percent of the vote. As of now, all of the bonds have been issued and almost all of the funds from the bonds have been spent. Every campus in the SVUSD has received some improvements from the bond, but almost every campus also has remaining projects that could not be completed because there was not enough money from the original bond, mostly due to rising construction costs and changing needs. In November of 2011, a poll showed that there could be enough voter support for a new bond that included a modest tax rate increase to fund unmet and new technology needs. Another poll was conducted in December 2013 and January 2014 again showing voter support for a new bond. The SVUSD Board asked District staff to further explore the potential for launching a new bond effort, targeted for the November 2014 election to meet technology needs and other facility upgrades not met by Measure C4. As this was only a workshop and not a formal board meeting, District staff only asked the Board if there was enough interest in continuing to gather information on a new bond to move forward in the process. The District has until Aug. 6 to file the required documentation with Ventura County to establish a campaign and election for Nov. 4. The District’s bond consultant told the Board that at this point in the process, overriding categories and estimated amounts needed for what the bond could pay for were all that would be required; the District and Board would have time after a potential bond was passed to decide on specifics. The amount of the bond is determined partly by how much the tax rate could be. The bond consultant proposed a range from $10 to $18 a year per $100,000 of property value, which is charged through District’s homeowners’ property tax bills. For example, if you own a house within the District valued at $300,000 and the bond passes with a $10 assessment, your property tax bill would increase by $30 a year for the term of the bond. There are about 72,000 voters in the District. The bond consultants also estimated that a November 2014 election would bring about 41,000 voters (based on 2006 and 2010 voter turnout). Passing a bond based on these numbers would require about 22,600 votes. The Board did ask the District to return in May with more detailed information about what items were slated for funding through a potential bond and how much money was being sought. From the information provided in the agenda report (link above), some of the items on the needs list were funded from an $8 million allocation the Board made last year for technology needs. Also, Trustee Dan White asked that a committee be created among community members with technology expertise to better define a long-term plan for the District’s tech needs, and preferred a November 2016 election. Trustee Arleigh Kidd also asked about a November 2016 election for the bond instead of one held later this year. Trustees Debbie Sandland and Rob Collins supported moving forward with a bond this year. Imagine all of Simi Valley Unified School District’s teachers and administrative staff coming together in the same location at the same time. That’s what happened on April 21 when more than 900 people came to Royal High School for specialized training in Common Core State Standards. Called Core Connections, the all-day event featured 118 sessions presented by 95 speakers for staff to choose from. The idea was to inspire and instruct teachers and support staff as all of the district’s schools transition to CCSS in the next school year. Examples of sessions offered included Non-Fiction Connections to Sophomore Literature, Teaching Your Students to Make Great PowerPoints, Engaging Unmotivated Students and Modeling Quadratics Through Movement. 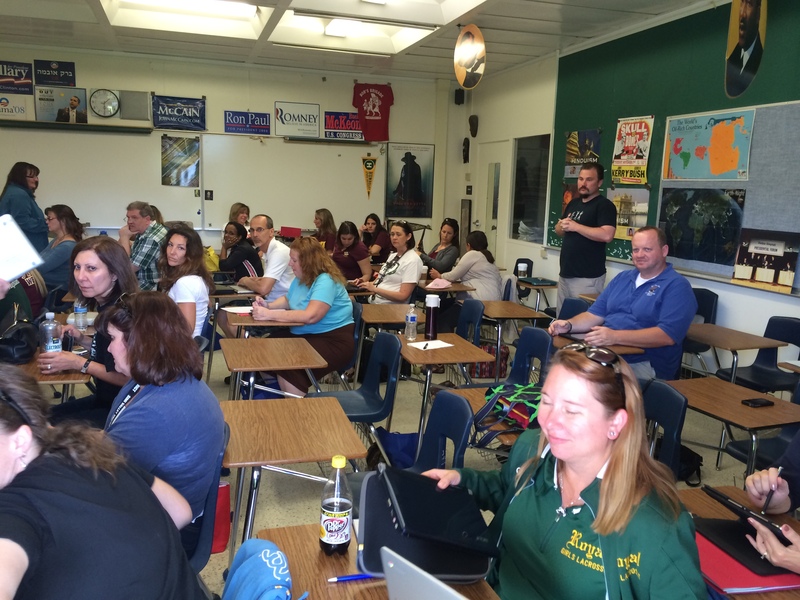 Teachers get ready for a class on using Google Docs with Royal High history teacher Brian Dennert. The event was organized and manned by the district’s team of Teachers on Special Assignments (affectionately called TOSAs), who spent months planning and creating the event to support the arrival of CCSS. It was only the second time in recent memory an all-district/one location program for staff development has been held, with the first being in February. Another staff development event will be held next year to continue the CCSS training and support. 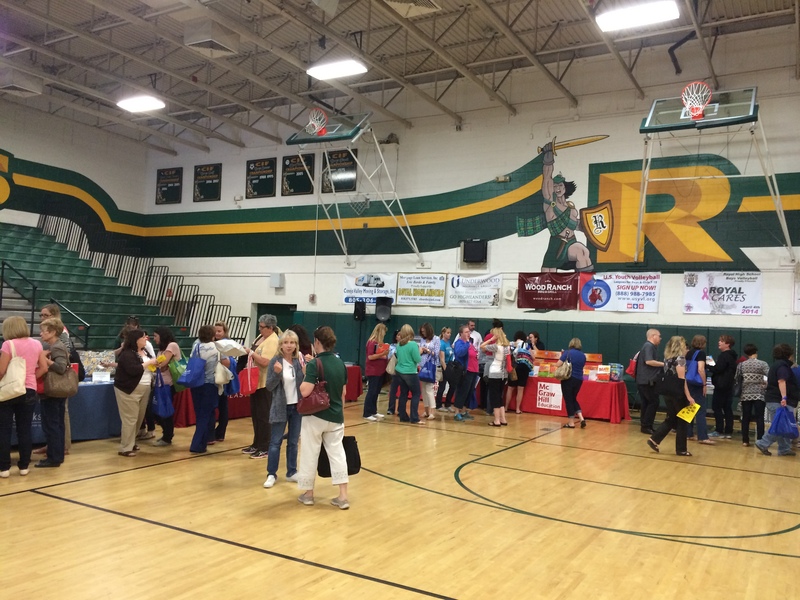 Many different companies set up informational tables in Royal’s gym to display support materials and information for our teachers. 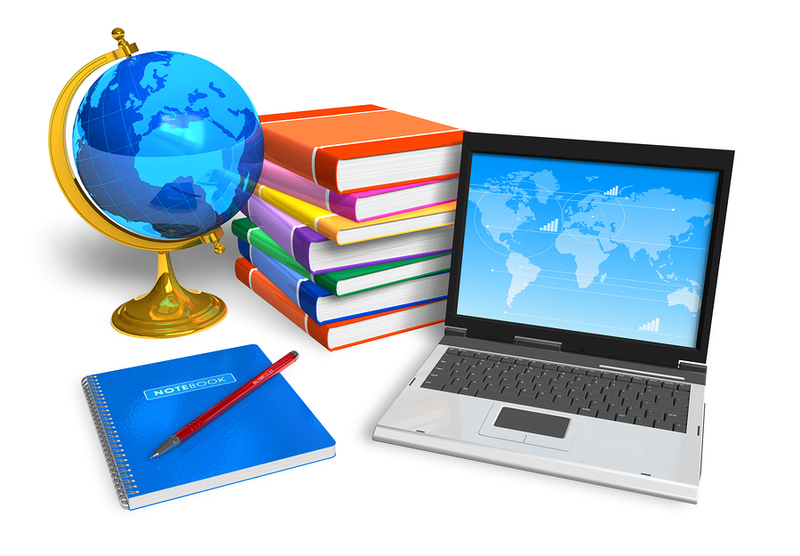 CCSS was adopted by the State of California and will be fully used in classrooms beginning in the 2014/2015 school year. 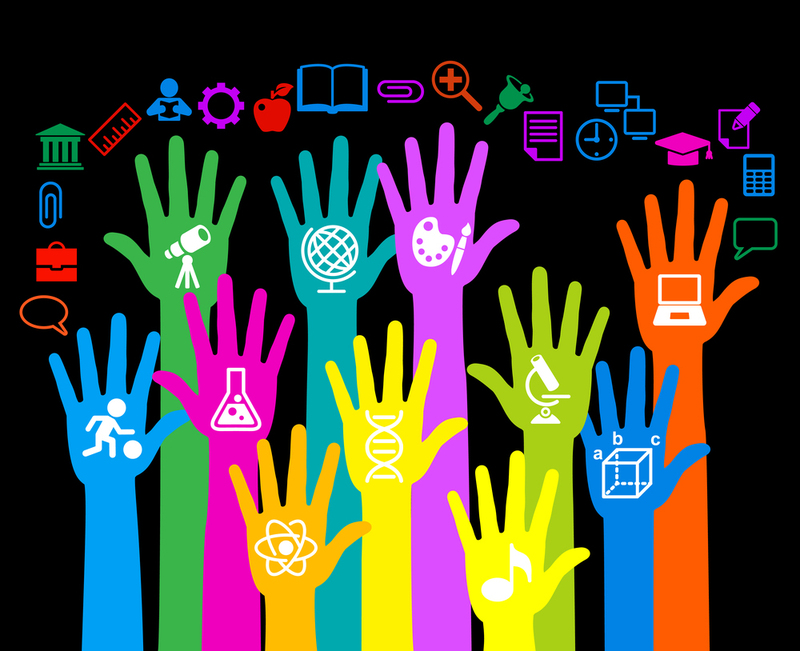 SVUSD began implementing CCSS in some schools and classrooms over the last couple of years and has been ahead of many other districts when it comes to professional development. Besides the work of the TOSAs, many community partners stepped in to support Core Connections, and we could not have made this work without them! We’re giving a shout-out below to all of them, but a special thank you goes out to Red’s BBQ & Grillery of Simi Valley. Red’s donated and served all of the food provided to the participants. Thank you Red’s for supporting our teachers! 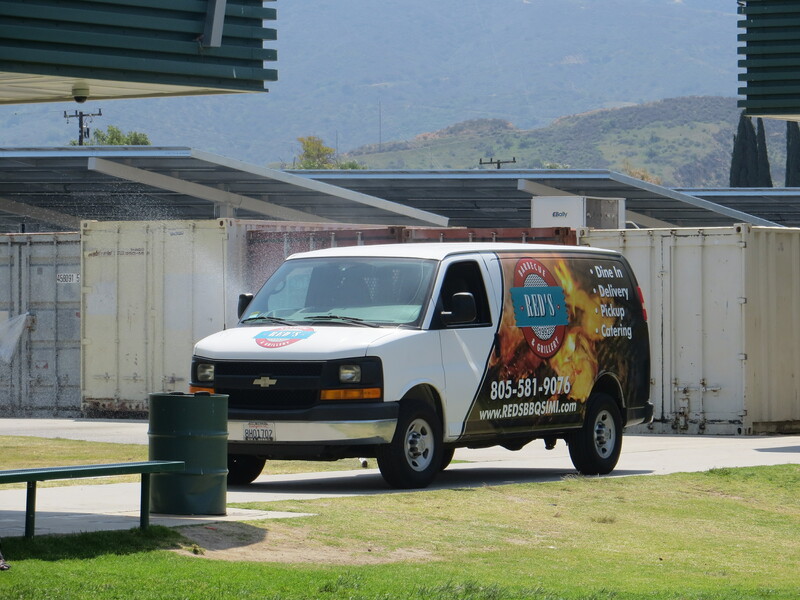 Red’S BBQ van serving up delicious munchies for our teachers and staff. All five SVUSD Board trustees were present at Tuesday’s regular school board meeting. Held at City Hall, the meeting was aired live on the city’s cable access and an archive copy of the video is available HERE. As expected, the meeting room was filled with concerned parents, district teachers and staff and community members, mostly attending over the issue of Simi Elementary School’s future. There were other items on the agenda that are significant, but in the interest of space and brevity this report will include those actions that seem to hold the greatest interest. If anyone is interested in something not listed here, post your question in the comments section at the end of the report and we’ll do our best to answer you there. A link to the full agenda with all back up materials is HERE. Minutes from the meeting will be posted to the District’s website after they are approved by the Board at the next regular Board meeting on May 13. During Public Comment, two members of the public asked the Board to spend available money to the benefit of the whole district and work on improving the district to attract more families and improve working conditions. Another member of the public praised the district for recent changes in technology and communications. During the Superintendent’s Communication, Dr. Kathryn Scroggin acknowledged the recent deaths in two unrelated incidents of two Royal High School students during Spring Break. She also addressed the recent downgrading of the SVUSD credit rating through Moody’s Investor Service. The rating was decreased from A1 to Aa3 with a “negative outlook.” Dr. Scroggin explained that the rating is part of an annual review by Moody’s, and while it is a very strong rating still for the SVUSD, the downgrade reflects the SVUSD weakening general fund position over the last two years and a change in Moody’s rating criteria. “We believe with a prudent approach, the district can reestablish a higher rating in the next 12-18 months. This change in our rating again cautions us to the importance of rightsizing our district,” Dr. Scroggin said. Approved in full by the Board, 5-0 vote; no changes or items pulled. Simi Elementary School is the city’s oldest operating building. Built in 1926, it’s comprised of one main administration building, six permanent classroom buildings and two portable units. In 2012 and 2013, after a series of serious safety concerns and infrastructure breakdowns in the main administration building, school operations were mostly relocated out of that building, pending the Board’s direction on seismic (earthquake) retrofitting and other modernization needs. On Feb. 4, 2014, the Board voted to move the Simi Elementary students and staff to Mountain View Elementary because of increased safety concerns with the entire property involving corroding gas lines and other utility issues. Today the school operates separately from Mountain View, with each school maintaining its individual schedules, staff and administrative personnel. About $2.7 million was set aside in 2006 from the Measure C4 Bond to update the Simi Elementary and there is a potential $900,000 available in state matching funds for the seismic retrofitting ONLY. Those matching funds require a commitment from the District to complete the repairs in a set timeframe and the District has only until June to request the funds. Repairs to the main administration building are estimated at $6.3 million. The rest of the campus will cost up to $4.3 million (estimated) to repair and modernize, making the overall cost of the Simi Elementary modernization about $10.6 million. The issue has garnered support among the Simi Elementary community as well as debate over the costs among other community members. Following the District’s recommendation, the Board voted 4-1 with Trustee Debbie Sandland dissenting to NOT modernize and seismically retrofit the main administration building on the Simi Elementary campus. The estimated cost of the effort was $6.3 million. Move forward with the plans and designs of the remaining Simi Elementary campus. This is NOT a commitment to do the repairs and modernization, only to gather the plans and designs of what will be needed. The Board added Amendment #2 that the original Simi Elementary campus would not be reopened for students and staff until at LEAST the 2017-18 school year. The Board voted unanimously to NOT install chain link fencing around the main administration building of the Simi Elementary School campus and instead research other security options for ensuring the building’s safety. Following the District’s recommendation, the Board voted unanimously to move forward with the modernization of the Mountain View Elementary campus at an estimated cost of $3.5 million. This project will include a new parking lot, remodeled restrooms, accessibility upgrades, updated utility lines, classroom and office renovations and a new fire alarm system. Most of the construction will happen over the next two summers to minimize the impact on staff and students. Following the District’s recommendation, the Board voted 4-1 with Trustee Debbie Sandland dissenting to sell the property. In an effort to save money, the District has researched alternate contracts for multi-function copy machines. Following a bid process, the District proposes signing a new five-year contract for the lease of new copy/scan/print machines throughout the District (these would completely replace existing machines) and the service agreements to maintain these machines, which would realize a savings of $325,560 between the existing agreement and this new one. Following the District’s recommendation, the Board voted unanimously to sign the new contract. The new machines will be installed at the schools and offices over the summer. This item is a fairly complex issue and has to do with changing how future School Board Trustees could be elected. Right now, all voting residents of the District vote for School Board Trustees at large. It’s been proposed that to follow emerging state law, School Board Trustees may need to be voted on by regions or areas created within the District. Instead of moving forward on this issue, the Board has asked for community input. We’ll release a more detailed Board Report during the week of April 21 to better explain the issue and to also provide supporting maps and other materials. Kenny Dougherty knew better than to drink shots of vodka with his friend Nick Boomhower. After all, hadn’t he always been taught that you don’t drink and drive? But it was prom night and you only live once. After getting their dates, Kenny took off speeding down Stow Street in Simi Valley and ended the run in a head-on collision with another car. Sarah Baxter, 18, was dead at the scene. Nick, 18, would later die at Simi Valley Hospital. And Kenny, when he sobered up enough to be aware, found himself in jail, facing criminal charges that could send him to prison for many years. Kenny Dougherty is being taken to jail while first responders wait for the funeral home to remove Sarah Baxter’s body from the scene. No, this did not really happen. 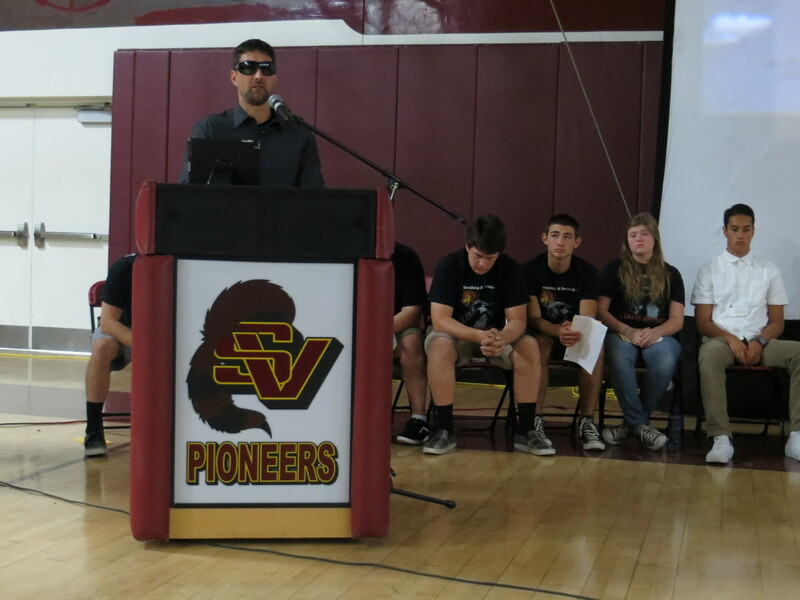 But it could have, because the students at Simi Valley High School worked hard to create the illusion of a drunk driving accident as part of the annual Every 15 Minutes program on April 8 and 9. 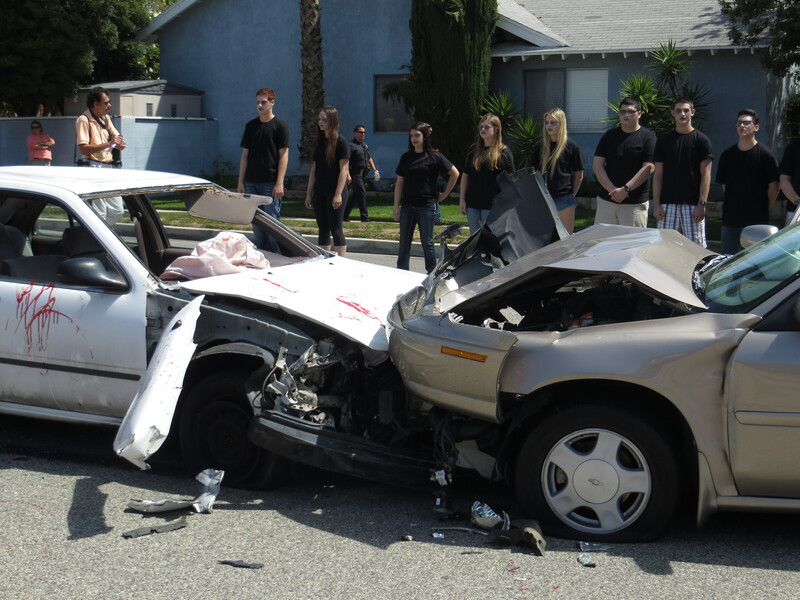 Sponsored through grants and donations of time, money and materials from numerous local agencies, businesses and organizations, Every 15 Minutes seeks to teach teens real life consequences of driving under the influence without the real life trauma. 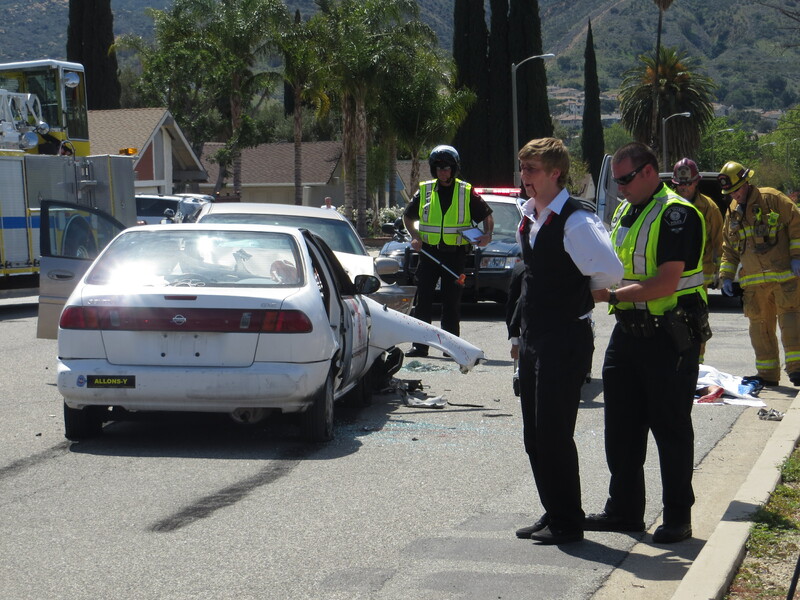 In Simi Valley, Royal High School and Simi Valley High School alternate the production of Every 15 Minutes each year. At each school, all juniors and seniors participate in the two-day program, ensuring that every student at the two schools is reached during their high school years. Students are nominated to participate in the program, and their participation is kept secret until the event begins with an announcement over the school’s loudspeaker that every 15 minutes in the U.S. someone dies in a drunk driving related accident. Then, the “deaths” of the participating students are announced every 15 minutes. The effect on the entire campus is somber and chilling. The students standing behind the crash scene represent the “Living Dead.” Their names were called out on the school’s loudspeaker throughout the morning. Sixteen Simi High students participated in this year’s program. But Every 15 Minutes is not just contained to the students and campus. 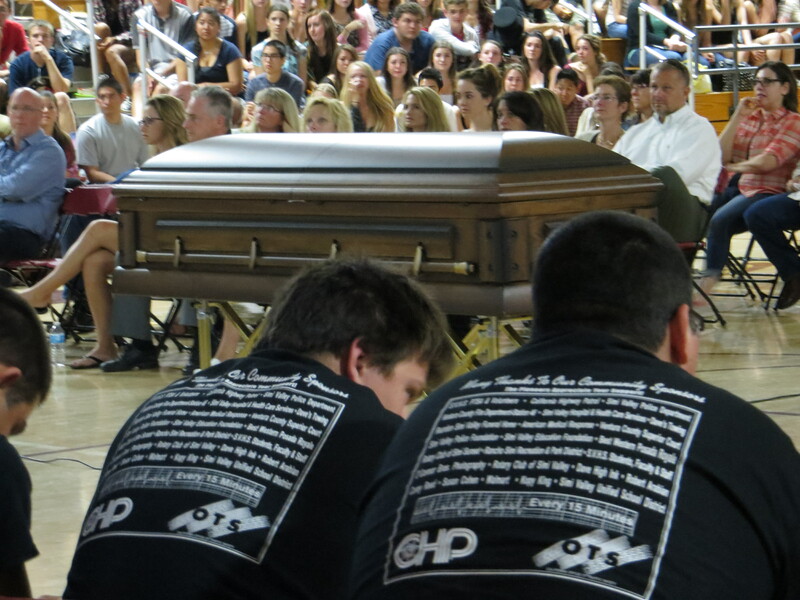 Every participating student’s family is integrated into the program, creating a powerful circle of tragic experience through the recreation of the accident, arrest, hospital scene, court case and funeral. 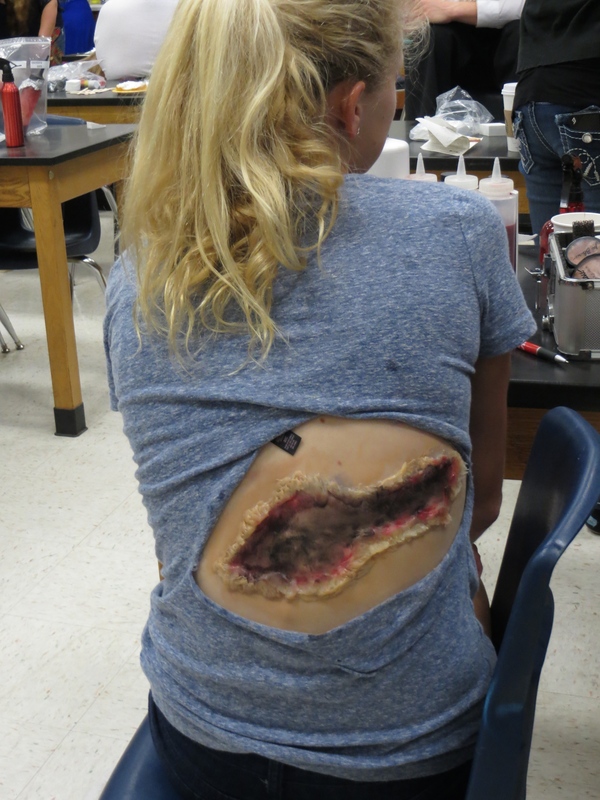 Sarah Baxter’s fatal back injury is being created by students from the Simi Valley Cosmetology School. Even though each family knew that the accident wasn’t real, the impact of opening their front doors on what should have been a normal morning only to be faced with their lives never being the same again, was emotional and sad. 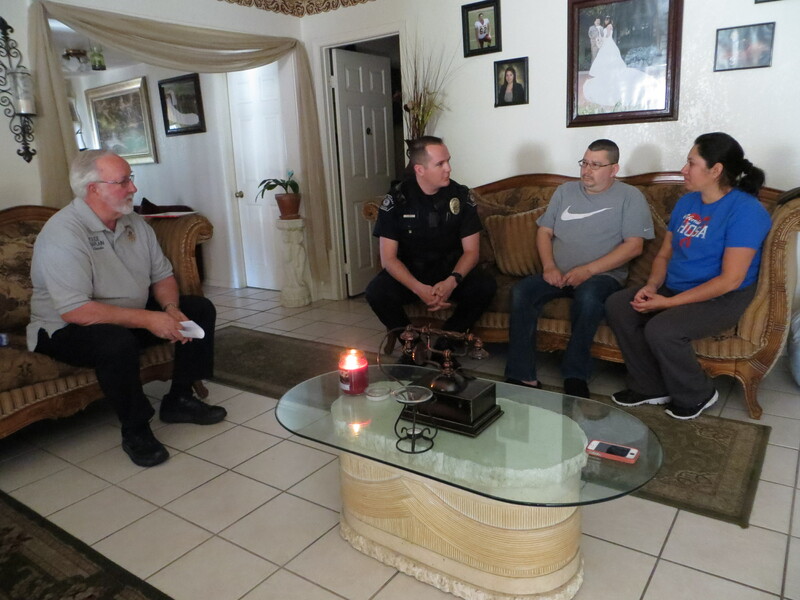 The Hernandez family have just been notified that their oldest son, Alan, has just been “killed” in a drunk driving accident. Families also wrote good-bye letters to their children, which the students read on the night after the crash recreation during an overnight retreat. Students also wrote their own good-bye letters to their families and friends. On Day Two, an assembly brought together the participants, families and Simi High’s juniors and seniors in the school’s gym. Students tearfully read their good-bye letters and listened to the guest speaker, Corey Reed, share about his own DUI accident in 2005. A Royal High School graduate in 2001, Reed played it straight while in school. But in the years following graduation, his partying—drinking, drugging and recklessness—became excessive. Corey Reed shares his experience from a drunk driving accident that left him blind and without his right leg. On the night of his life-changing accident, his friend was driving into Simi from a club. Both young men were drunk and after reaching speeds up to 101 mph, the Chevy Tahoe they were in crashed into some trees on Sequoia Avenue. Corey lost his right leg and his eyesight in the accident. He was 23 years old. His friend landed in jail. “We were both victims of our lifestyle choices we made that night,” Reed said. On April 8, 2014, the five-member SVUSD Board of Trustees met for a Special Board Meeting-Measure C4 Bond Workshop to discuss how to spend the bond’s remaining $17.1 million. As of Feb. 28, about $75 million in bond funds remain for bond-authorized projects. Of that, $57.8 million is already committed to projects in varied states of progression. The remaining $17.1 million still needs to be decided upon. As this was only a workshop and not a formal board meeting, District staff asked the Board what projects might move forward. This means that from a dense list of projects suggested, the board would remove those projects it didn’t want to consider. There was no commitment made by the Board to move forward with any of these projects; only direction to staff to gather more information from staff about each project’s costs and needs. The projects for consideration totaled about $28.7 million with Simi Elementary School’s projects adding almost $10.6 million. The total of all the projects under consideration is $39.3 million. The list of projects and potential costs is linked HERE. You’ll find it on page 3 of the meeting agenda. From that list, the board removed proposed improvements to the Education Service Center (District office) for $2.9 million. All other projects remain for consideration. The Board members discussed the history behind the unfinished Measure C4 bond projects. For several years at the start of the bond, there was a boom in public school bonds and modernization projects throughout California. As a result, construction costs rose substantially, making many of the originally planned projects throughout the district’s schools too expensive to complete. At that time the Board prioritized projects that solved health and safety concerns and upgraded technology. Every campus was left with projects that were not completed. The Board indicated that when they continue considering the listed projects that they will likely take the same approach and place a higher priority on those projects that are needed for health and safety concerns, such as the roofs at eight school sites, refurbishing the HVAC systems at several schools and concrete pavement repairs and improvements. Nine people commented publicly at the meeting. Seven were in support of allocating remaining Measure C4 bond money to Simi Elementary School’s improvements. One speaker, speaking as a member of the ICOC, asked that the board consider all of the projects NOT completed from the bond due to increased construction costs in the bond’s early days which caused some projects to be taken off of those schools’ lists. And one speaker, a teacher from Royal High School, asked for the completion of a student patio at Royal High School. This project is listed for consideration. While the Board was not making any decisions about Simi Elementary’s future, trustees did ask District staff to obtain a more accurate cost for the repairs needed at the school. Also, staff was asked to provide the process for transitioning an elementary school into a magnet model, following one of the suggestions to transform Simi El into a performing arts/technology magnet elementary school. The next regular SVUSD Board Meeting is scheduled for Tuesday, April 15 at City Hall. Closed session starts at 5:30 p.m. and open session will begin at 6:30 p.m. The full agenda and back up materials will be posted to the District’s website by Friday afternoon.